The only thing that really goes for this park is Desperado, a decent Arrow hyper. Operations are terrible with 7-minute dispatches on Desperado and employees that likely don't know what guest service means. The log flume has wood that is rotting in its theming and the park is not maintained well. The park is just good for as a credit run pit stop for Vegas. Buffalo Bills is first and foremost a casion. I believe they had plans to place more emphasis on rides and attractions, its just that the only people who came were older. Desparado, while fast with a good layout is very rough. If it were even remotely smoother it would be a great ride. The shot tower rarely operates and the indoor log ride is very cool. If coming from LA it's worth a stop, if in LAS, make the drive do some shopping in their outlet mall, and head back after 2 hours. If you like coasters and you're travelling to LA from Vegas or visa versa there is NO EXCUSE not to ride this coaster. Whether the thing stalls or the mechanics are just incompetent I'm not sure but the net result is up-stop wheels set half a mile too low with the consequence that the camel backs feel like you're on a old wooden coaster. Its a truly terrifying experience that is genuinely thrilling in the way that only true carney operated stuff can be. Buffalo Bill's isn't a true amusement park, but they do have a few rides. Desperado is a fun coaster, but whatever you do ride in the middle seat. This is the only way to avoid getting a free spine adjustment. The log ride is fun if the guns are working, otherwise it is not that exciting and is overpriced. Finally, Turbo Drop is only worth it if you have not been on a taller drop tower. I really did not care a whole lot for this place, but it isn't too bad for a cheaper hotel that is near Vegas. I really did not care much for Desperado at all. 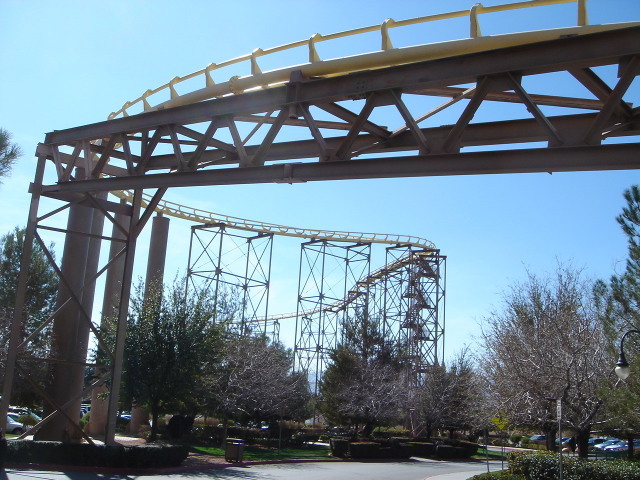 Desperado is quite an amazing ride and really kicks the crap out of you. 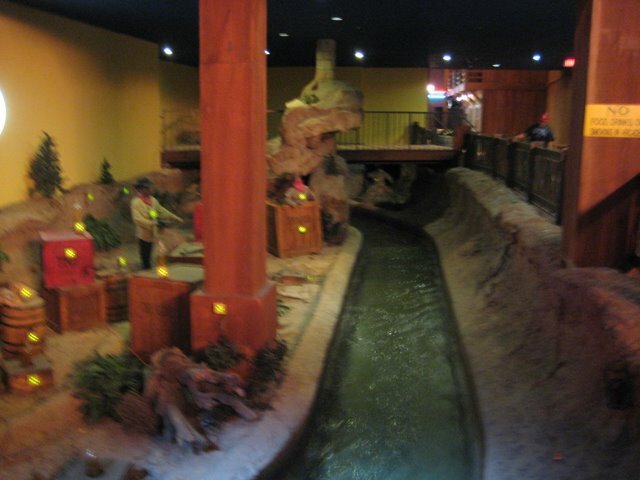 There are other rides at Buffalo Bill's and the shooting flume ride is quite an amazing feat of how bad a ride can be. When you are done dishing out your wallet for the rides at Buffalo Bill's then try your luck at the tables. Remember to put 20 bucks down on red in roulette. 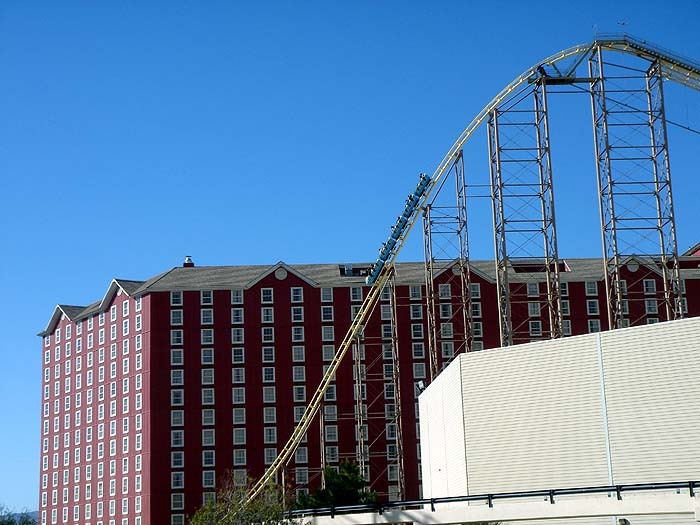 Desperado is the only coaster at Buffalo Bill's. The coaster shows its age, but does have an interesting inside/outside layout. The coaster is best known for "the airgates of death"! When the ride operators say "stand clear of the closing gates", they mean it!